You guessed it they serve pancakes! But they don’t stop there, they have a wide variety of other breakfast dishes to make everyone happy. Great pancake plates like Banana nut, death by chocolate, Oreo, very berry, Reese’s, Smores, Caribean Pleasure and Boston cream. You can get a half stack or go all the way with a full stack. Belgian waffles and French toast are also popular dishes. They offer the Kate’s Special, such as Sweet potato pancakes, Pumpkin French toast, Pigs-n-blanket, and banana nut French Toast. Serving up the eggs anyway you want them, over-easy, scrambled, 15 choices of omelets, 6 choices of eggs benedict. Are you hungry yet! Well we are not finished yet! We need to talk about the many health breakfast choices, such as the California platter, Kate’s delight and Multigrain pancakes. Breakfast isn’t complete without a side of meat, they have, sausage patties, links, turkey sausage, bacon, ham, corned beef hash and sausage gravy. 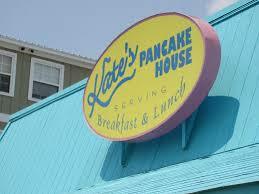 They are worth the trip, make them a must try when you are visiting the Carolina Beach and Wilmington Area of NC. We had a half stack with sausage and a egg plate with grits, wheat toast. Thanks Kate and crew, we’ll be back! !